On 18th March, Christie Cherian and Peter Spackman officially visited Frontier Lifeline Hospital to see the wonderful work being done by Founder and CEO, Dr K M Cherian. Frontier Lifeline Hospital is a very impressive state-of-the-art cardiac hospital. Dr Cherian himself showed visitors around the hospital. They spent time looking at the ICUs for adults and children where patients recover from surgeries (25% of their patients are from overseas). Dr. Cherian also presented his project on a ground-breaking medicare village on a SEZ-site oulining his vision for scientific studies in the medical field. 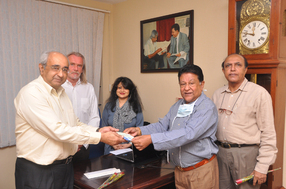 The visit was rounded of with BBG Chennai presenting Dr. Cherian with a contribution to commence a fund towards the continued good work in pediatric cardiac surgery for poor and needy children. You can read more about BBG’s social initiatives here. BBG – Bangalore now moves into formation stage with the right founding members coming into place. During a visit to Bangalore, Christie Cherian called on Ian Felton, Deputy High Commissioner, BDHC, Bangalore and met a couple of potential conveners to put BBG – Bangalore into play with Chennai’s offer of help and assistance. The Queen’s Birthday celebrations on 15th March 2013 hosted by Ian Felton was also an occasion to bring together around 25 potential members. A meeting is planned for 23rd March to initiate the activities. On 6th of March, the British Deputy High Commission (South India) hosted a reception to celebrate the birthday of Her Majesty Queen Elizabeth II. The reception was attended by many BBG members apart from various other dignatories. During the course of the evening Mike took the opportunity to round up the events anchored and organised by the BDHC and UKTI. He spoke of the successful Olympics 2012, PM’s visit to India and various other visits by Ministers. Mike also had a special mention of BBG Chennai and its successful National Conference in September 2012. Mike congratulated the entire BBG team and Christie for anchoring the activities successfully. He added that BBG Chennai has been striving towards a wider range of activities to improve bilateral trade and commerce. The evening ended with fellowship and a concert by Oscar winner, Tanvi Shah and her band. For the benefit of BBG Members and ASA clients, ASA & Associates (a BBG member) conducted a very useful seminar reviewing the recently announced Budget. ASA’s Ajay Sethi gave an insightful presentation on India’s current economic position followed by Sunil Arora’s highlights on the Budget. Attendees found the information extremely helpful. Capt. Ramaswamy of Sea Team provided their Training Centre for the event. Last week, Mike Nithavrianakis accompanied the High Commissioner, James Bevan to Trivandrum. Although this was Sir James’s first visit to Trivandrum, he has visited Kerala before; most prominently when he led the largest ever trade delegation to the State for Emerging Kerala in September last year. Last week’s visit included calls on the Chief Minister, the Director-General of Police and ISRO. The High Commissioner also visited Technopark and had a very good meeting with UK firms and Indian investors. Many thanks to BBG committee member Vijay Kumar (Test House) for organising the gathering and to Rakesh Gupta of Allianz Cornhill (ACIS) for hosting it at their premises.